Records tumbled as Chelsea crashed to their largest Premier League loss in a 6-0 hammering at the hands of Manchester City on Sunday. 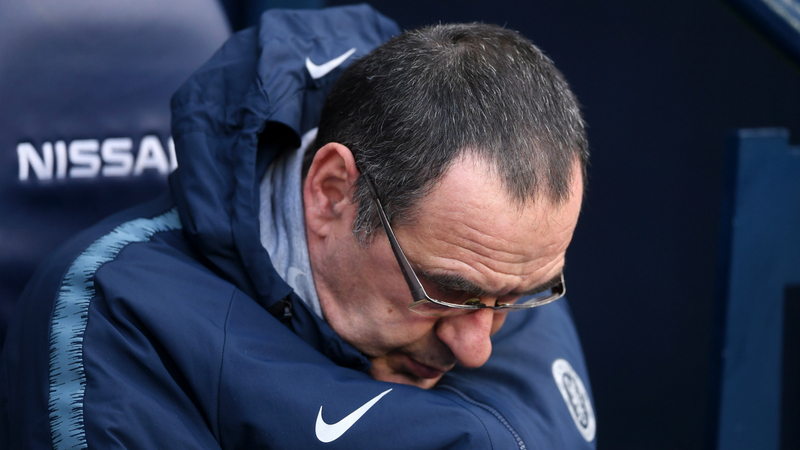 Maurizio Sarri's reputation took another damaging blow less than two weeks on from the dreadful 4-0 defeat at Bournemouth with the Italian's team ruthlessly sliced apart at the Etihad Stadium. The Blues shipped four goals in the first half of a top-flight match for the first time since 1999 and the ugly stats piled up from there, Sergio Aguero and a rampant City offering no respite after the interval. Star striker Aguero celebrated a scene-stealing treble while Raheem Sterling bookended the scoring on a miserable day for the visitors, who dropped back to sixth in the table. Here is a snapshot of the damning numbers from a dark day for Chelsea. 1 - This was the first time a Sarri side has conceded more than four goals in a match, and marked his heaviest ever league defeat as a head coach. 4 - Chelsea have shipped a minimum of four goals in consecutive away league games for the first time since December 1990. 6 - The Londoners conceded six goals in a Premier League match for the first time in their history. This was also their heaviest hiding in all competitions since April 1991. 0-6 - Chelsea suffered their heaviest defeat in any competition since losing 0-7 to Nottingham Forest in April 1991. Drubbing. 7 - The Blues are winless in their last seven league away games against 'Big Six' teams, and have lost the last five in a row. 13 - Only embattled Fulham have given up more Premier League goals in 2019 (15) than Chelsea's 13.